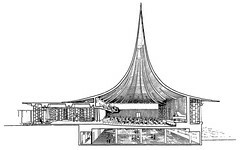 Section perspective drawing through main auditorium, entry hall, and gathering space at lower level. The level of the entry hall at left (South side) is higher than the ground level at the rear (North side). Armstrong's organization of the program takes advantage of the significant slope of the site, initially one of its major drawbacks. Drawing courtesy of the Harris Armstrong Archive, Special Collections, Washington University of Saint Louis.